State forest | Australian Climbing Association (Qld) Inc. The above sign recently appeared at the top of Point Pure, in the Brooyar State Forest. 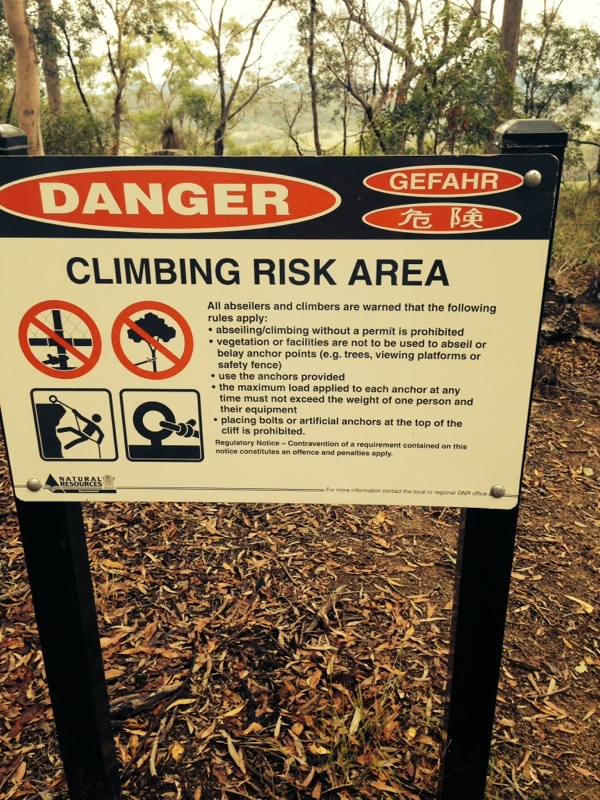 Whilst the climbing community are used to seeing the occasional notice appear here and there, this particular one caused an immediate kick-back on social media because it stipulated a requirement for permits. In reality, I suspect that the wrong sign went up and we can expect to see it taken down some time soon. However, as I tracked the dialog on social media, it became clear to me that this example, having grabbed everyone’s attention, would serve as a useful means to illustrate the nature of executive authority in the management of the public estate. If we want the climbing community to be effective stewards of the crags at which they climb, they can be so only to the extent to which they understand the process of management. Note that this particular example is specific to the management of a State forest. However, the principles I’ll point to apply equally well to management of a National Park, although the actual legislation differs. The immediate, visceral response to such an event will ever be along the lines of “them” and “us”, and whilst this is understandable, I have always argued that such a response is ultimately unhelpful and will do nothing to resolve access issues. We need to stop chaffing at the “system of people”, the bureaucracy, and shift our focus to the “system of laws” that define the public estate and how it is to be managed. So… some dude comes along and erects a sign at Point Pure stating that you will cop a fine if you do not comply with requirements x, y and z. Who the hell does he think he is, bossing folks about on public land? Well, as it turns out, there should be nothing arbitrary about such an action, and the source of authority, assuming a valid authority exists, lies far beyond the person placing the actual sign. It’s a system of laws, remember, not people, so let’s bypass the people and go look for a basis for the action within the State legislation. Am I on public land or not? The first port of call is to look up the land registry and locate the parcel of land that encloses Point Pure. Using Qld Globe and Google Earth this is a five minute job. We find Point Pure is within the large 3,330ha parcel 82/FTY1310. We can then check the tenure of this parcel and confirm it is indeed State forest. Of course the question then arises as to what sort of beast is a State forest. Well, it turns out that State forests come into being by virtue of s25 of the Forestry Act 1959, under which they are set apart from Crown land, and declared as State forest by the Governor in Council. Governor in what?, I hear you ask. Yes, quaint naming to be sure, but easily understood – the Governor in Council is the highest level of executive government in Queensland, comprising members of Cabinet plus the Governor who just tags along for the ride. So, State forests are brought into existence by means of the Forestry Act, and from that point onward are managed under its terms. the permanent reservation of such areas for the purpose of producing timber and associated products in perpetuity and of protecting a watershed therein. ensure each State forest is used and managed in the way the chief executive considers appropriate to achieve the purposes of this Act, having regard to— (a) the benefits of permitting grazing in the area; (b) the desirability of conservation of soil and the environment and of protection of water quality; (c) the possibility of applying the area to recreational purposes. Broadly speaking this means climbing as a recreational activity is to be tolerated, provided it doesn’t interfere with timber production. I say tolerated, because whilst it appears the chief executive has no statutory obligation to promote recreation within State Forests, it is clear he has an obligation to manage the area for recreational access where the possibility exists. I read this as meaning that there should be “free and fair access” to the public estate set aside as State forest where such access doesn’t impact timber production. What is a regulatory notice? vehicles; or (c) the bringing into the State forest or that part of the State forest of animals or animals included in a specified class of animals. Set out under s34AA of the Forestry Act we see provisions for the “Regulation of use of State forests by notices”. It follows from s34AA that, at Point Pure, an administrative agent empowered under the Forestry Act may place a regulatory notice that specifies “a particular requirement or particular requirements to be complied with by persons entering, or in, the State forest or that part of the State forest”. I’ll discuss the detail of the requirements in another post. For now, I want to concentrate on the authority to erect a sign in the first place, because without such authority, requirements mean very little. Who is empowered to place a regulatory notice? So how do we know who is the administrative agent for the Forestry Act? Who says one bunch of bureaucrats may go about putting up regulatory notices in State forests yet another bunch may not? Once again, this might seem arbitrary, but in principle it’s not. The Queensland Constitution describes the process to be followed subsequent to a general election by which the leader of the majority party is invited by the Governor to form government. Part of this process involves appointing Ministers to portfolios, assigning administrative units to those portfolios and enumerating the acts of parliament they will be responsible for executing. The outcome of this deliberation is published as an Administrative Arrangements Order. If we look up the order published for the current government, we see that the Forestry Act is jointly adminstered by the Minister for Agriculture and Fisheries and the Minister for National Parks and the Great Barrier Reef. The division of responsibility being “Custody and Management of State Forests covered by the Plantation Licence Area” in the case of the former, and “Custody and Management of State Forests not part of the Plantation Licence Agreement” for the latter. The final piece of the puzzle that remains to be solved is which of the two Ministers is responsible for the sign. Once again Qld Globe makes our job easy. Looking up the extents of land under plantation licence agreement we can confirm that the crag at Point Pure is not within a plantation licence area, and thus the Minister for National Parks and the Great Barrier Reef has ultimate responsibility, and, according to the Administrative Arrangements Order acts through the Department of National Parks, Sport and Racing. In practice we would expect to see QPWS, as a sub-unit of NPSR act as the administrative agent. Now, the notice in question claims authority from the Department of Natural Resources. A quick search of the Administrative Arrangements Order for the current and last government fails to turn up a department of that name, and, furthermore, the nearest matching administrative unit, the Department of Natural Resurces and Mines, is not responsible for execution of the Forestry Act. And even if they were responsible, the Forestry Act at s34AA(3)(c) and s34AB(1) makes it clear that a regulatory notice must “expressly state that a contravention of a requirement contained on the regulatory notice constitutes an offence against this Act”. Here we have a curious artifact of the bureaucratic machine indeed, and that’s even before we get onto the subject of the actual requirments themselves. As it stands, I doubt this sign has the force of a regulatory notice, and the mere act of saying it is can hardly make it so. A regulatory notice will, a) state the Act or Regulation that underpins it, b) state the penalty prescribed by the subsidiary legislation for a contravention, and c) state the responsible administrative unit.